This is a perfect treat for a 4th of July morning. And it’s super good, too! I’m not a big fan of the blueberry muffin, but this cake is so much more. 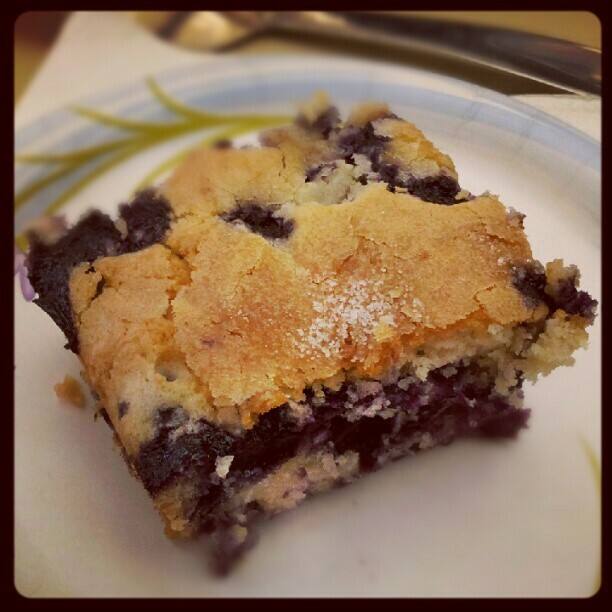 The cake is moist, light and a nice ratio of blueberries to cake. The crust on top has a crunch and a beautiful brown color. The buttermilk does something to it to give it that something different. But it’s the lemon zest that steals the show. It gives a refreshing taste to the small blue fruit. Tia served it warm and it was blueberry goodness. The recipe is found here: http://www.alexandracooks.com/2011/06/29/buttermilk-blueberry-breakfast-cake/ It has beautiful photos to take you through the steps and make even the most novice baker create something delish!